Dave Foster from TalkFloor.com and I connected recently to continue our conversation about social media marketing. This time we discussed Google for Visibility. 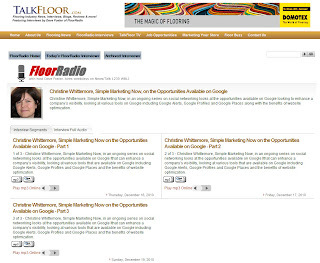 Christine Whittemore, Simple Marketing Now, in an ongoing series on social networking looks at the opportunities available on Google looking to enhance a company’s visibility, looking at various tools on Google including Google Alerts, Google Profiles and Google Places along with the benefits of website optimization. As usual, we had a blast and even managed to touch on geolocation / location based marketing tools! 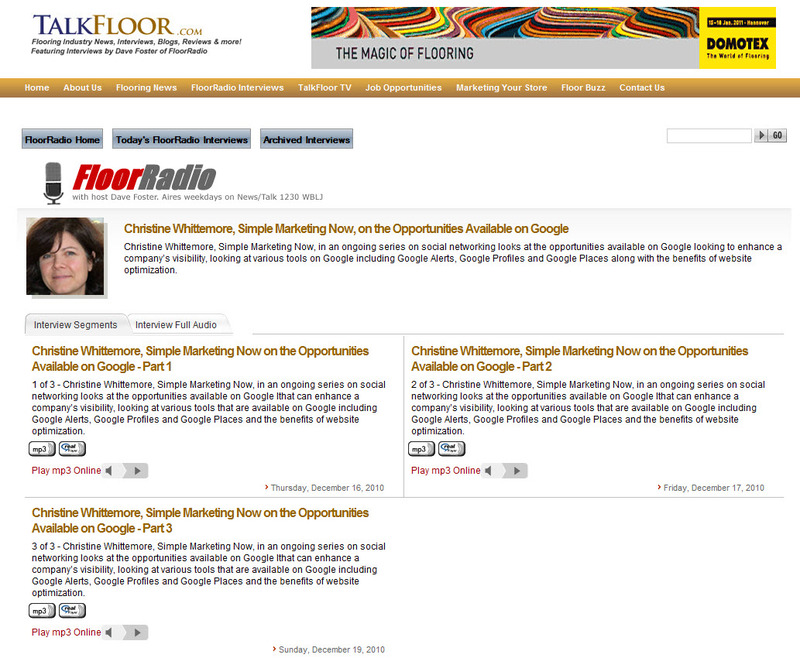 You can access the three interview segments by clicking on this link to Christine Whittemore on the Opportunities Available on Google. Each segment is approximately 12 minutes long. My show notes for Google for Visibility. My theory is – if you can’t be found online, you don’t exist. Extreme, but increasingly true when 97% of local consumers use online media to research businesses in their community** BIA/Kelsey research. People start at a search engine to start any kind of research. Majority of the time, that search engine is Google. Being found can be an issue for people working at the same organization for a long time, for businesses used to doing business in person. That means it’s important for all of us to be paying attention to our digital visibility – for ourselves individually and for our companies. Check out your “google juice”. What do you see? Do you show up? Is it positive? Negative? Irrelevant? You want to pay attention to the results on the first 3 pages; ideally, the majority of those 30 entries are about you and positive. This is your opportunity to start managing your social reputation. Everyone should set up Google alerts. Set them up for your name in quotes, for your company name, for your company URL, for products terms, even competitors. I still meet people who don’t take advantage of Google alerts. They are free. You can set them up so you receive email notifications; you can even have them flow into Google reader where you can further organize them into relevant folders. Google alerts allow you to monitor any new entries about you. For example, if someone writes about you in a blog or reviews your company. You’ll know about it and can say thanks. Note: you’ll need to set up a gmail account for yourself. + Exclude words using the minus sign in front of your alert term. Experiment with these in a search window and fine tune your query based on how relevant your results are. Check out this marvelous Google Guide for Selecting Search Terms which includes lots more details! Google Profiles: Allows you to gather all of your digital presences in one place: LinkedIn, Twitter, YouTube, websites, SlideShare presentations, Flickr photos… You can add specific photos to your profile. You have unlimited space for telling your story. It complements your LinkedIn profile. A great example is Glenn Raines [google.com/profiles/rainesmaker]. Mine is google.com/profiles/cbwhittemore. Good reason to pay attention to Places is that Google has just released Google Hotpot, a location-based recommendation engine for places. It has a social element and integrates with mobile smartphones. Note: you had better be paying attention to mobile for all of these digital tools. BTW, also be aware that Yahoo offers local listings. A basic free listing lets you include phone/address/website, store hours, products. With this topic, we are getting into SEO or search engine optimization. Since we’re talking Google, it’s important to be aware of what Google pays attention to for digital visibility particularly as it relates to your business website. 4. Static vs. dynamic content or websites vs. blogs. 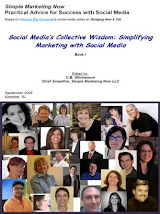 Google has issued a Search Engine Optimization Starter guide that I recommend you read. What do your physical & digital retail experiences communicate? Are they fresh? Complete your LinkedIn and Twitter profiles. Participate in those networks. Read the Google SEO Starter Guide. Hi Christine, thanks for the shout out on my Google Profile as an example of what one can do with formatting and integrating links. I sure like the flexibility to format the "About me" section by adding links to your content. The Google Profile is a great companion to the LinkedIn Profile and can really boost your "findability." Thanks again and keep it simple! Glenn, thanks for making it simple to appreciate the Google Profile. You created a great example to share with others.